Looking for more information on Banned Books Week this week? Check out the link below! Google has coordinated several “Hangouts on Air” throughout the week with highly acclaimed banned/challenged authors. Check out the link below for more details and for a list of sessions. A reminder! 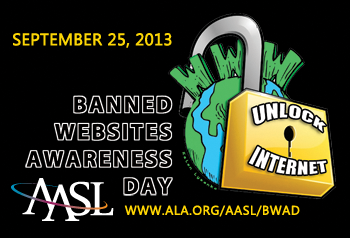 Wednesday, September 25 is the third annual Banned Websites Awareness Day, which is designated by the American Association of School Libraries (AASL). To raise awareness of the overly restrictive blocking of legitimate, educational websites and academically useful social networking tools in schools and schools libraries, AASL designates one day during Banned Books Week as Banned Websites Awareness Day. For downloadable graphics and more info, click on the link below.